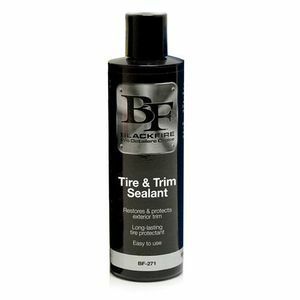 BLACKFIRE Tyre & Trim Sealant is a thick, gel-like formula that penetrates deep into the pores of plastic, rubber, and vinyl exterior trim, restoring the finish to factory-new condition. A traditional trim dressing might last a week or two if you’re lucky; BLACKFIRE Tyre & Trim Sealant provides MONTHS of durable protection. Use it on tires as a long-lasting, waterproof dressing! BLACKFIRE Tyre & Trim Sealant is far more than a trim dressing. This polymer-based trim restorer forms a bond at the molecular level, restoring the surface while coating it in a durable, protective shell. BLACKFIRE Tire & Trim Sealant doesn’t wash off in the rain – it actually causes water to bead up like a wax! Treated surfaces will have a factory-fresh appearance – not a sticky, greasy mess like other so-called trim restorers. Use BLACKFIRE Tire & Trim Sealant on moldings, bumpers, windshield cowlings, louvers, air vents, wiper arms, window trim, mudguards, side mirror housings, bed rails, door handles, and more! The durable UV inhibitors block the sun’s damaging rays, keeping your trim looking new for months. BLACKFIRE Tire & Trim Sealant restores, protects, and enhances exterior trim of any color. This polymer-based trim restorer doesn’t contain any dyes or colorants. The formula creates a finish that looks and feels like the day your vehicle was new. BLACKFIRE Tire & Trim Sealant will not streak or wash off when it gets wet. The only maintenance required is regular washing with a quality shampoo, like BLACKFIRE Wet Diamond Conditioning Shampoo. Use BLACKFIRE Tire & Trim Sealant to both clean and restore the faded rubber on your tires quickly and easily! Clean the surface to be treated with BLACKFIRE APC All-Purpose Cleaner. Ensure surface is completely dry to the touch prior to application of BLACKFIRE Tire & Trim Sealant. Apply BLACKFIRE Tire & Trim Sealant to desired surface using a foam or microfiber applicator. If applying to tires, use a foam tire applicator. Apply a nickel-sized amount to applicator and spread a thin, even coat over the surface. Immediately buff surface dry with a microfiber towel. If used on tires, allow to dry before driving.